Quarter of 2015. Although both counties experienced the vacancy decrease, Ada County had the higher reduction in vacancy rates by 19% last quarter. We had a great turnout for last night's meeting. What a great way to send off yet another year. We had the pleasure of hosting motivational speaker Dr. Vincent Kituku, who's biggest take away from the evening was "keeping everything in perspective". Along with our guest speaker, a real estate market update was presented along with some pointers about making the best use of your inspection contingency when you're in contract on a property. Our "Good News" segment featured recent release on job growth statistics for Idaho as well as approval on a development project sure to make an impact in Boise's Westend. As always, we reserved the last portion of our meeting for open networking which gave all of our members a chance to meet one another & to be able to make those connections. Besides the education members receive at our monthly meetings, the Boise Investor Group places a large emphasis on the networking piece as we feel as though growing your contacts not only allows us to be able to learn from one another, but you may just find that next deal by simply striking up a conversation. If you missed us this time, we host our monthly meeting the 2nd Thursday of every month & hope to see you out in January. As Real Estate Investors we are always keeping an eye what clients, home-buyers and renters, are looking for. The best ways to make a home appeal to today’s home buyers and renters is by knowing what they are looking for. Beyond location and price point these are the home features that home-buyers and renters find most desirable. Energy Efficient Appliances are becoming more important to home-buyers. This is becoming a standard in new construction homes. Granite Counter-tops, in particular, are losing "wow" factor. Two-Story home with a bedroom on the main floor is gaining popularity among home-buyers. Giant Jetted Bathtubs are a big turn-off for most home-buyers. Both buyers and renters dislike "old' wallpaper and yet wallpaper is very common in new construction as a buyer preference. We had a fantastic turn out for our monthly meeting yesterday. Mr, Hargis, a local private lender gave our members an in depth presentation on Private Money For Your Real Estate Deals. During our presentation we were able to walk through on how to present your deal to a private lender, the basics of private lending i.e. typical terms & conditions, what to expect for closing time frames & most importantly if you're new to the business- what's the best way to get in with one of these types of lenders. Along with our guest speaker, members had the opportunity both before & after the meeting to network with others. We feel this is a key element in not only expanding your contacts but being able to get deals done. During each of our monthly meetings, we go over recent real estate market stats that include Ada & Canyon Counties, New Construction as well as any recently released rental data & news pertaining to our area. If you missed us this time, we meet the 2nd Tuesday of every month. 6:30pm at Title One in Meridian. Vacancy rates moved down slightly to 3.6% for the 3rd quarter of 2015. This is a decrease of .3% from last quarter. 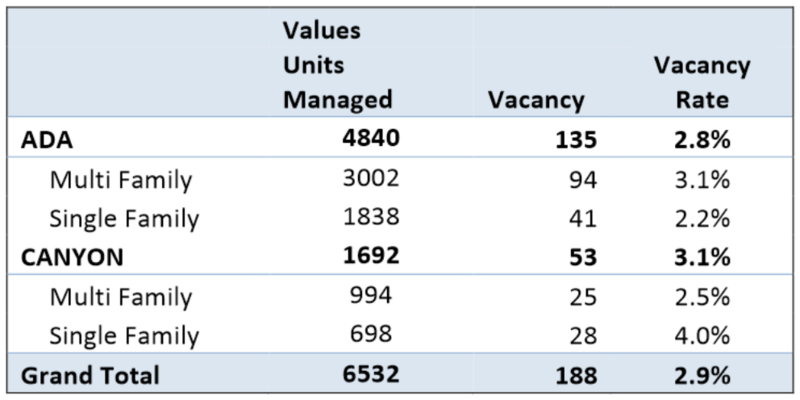 The largest decrease in vacancy rates from last quarter was multi-family homes in Ada County. Canyon county multi-family had a decrease of .2% and single family homes where unchanged.